So, there's this fun challenge/meme going around called #MeetTheArtist. 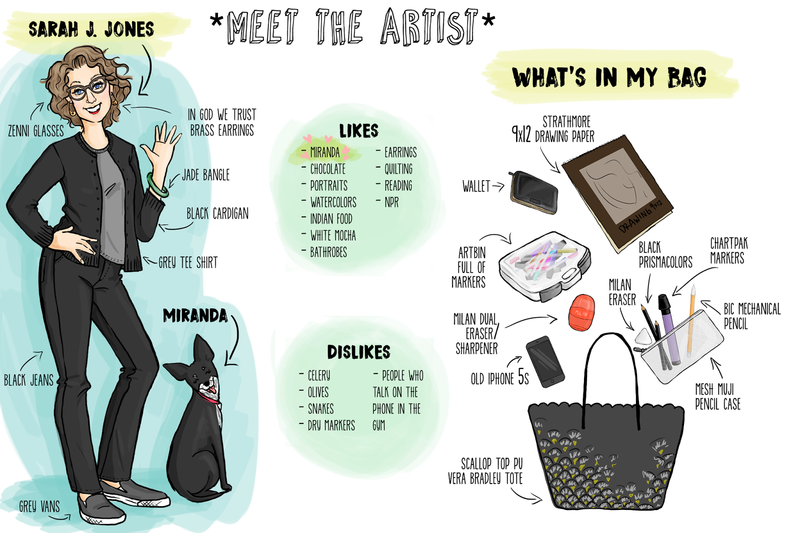 Each image contains a drawing of the artist, their likes and dislikes, and what's in their art bag. I am obsessed. So, of course I made my own. I tried to make this square so you'd be able to see it well in Instagram, but I had to much stuff. So, if you click on this image and open it in a different tab, then you should be able to zoom in pretty well. Now, I know I'm not as skinny as this image. I tried to make my body proportions a little more realistic, but having been a fashion designer, my default cartoon character is about seven feet tall. So, the fact that this one looks potentially believably 5'7" at all, is pretty good in my opinion. Well, I think this thing is pretty self explanatory. Enjoy!